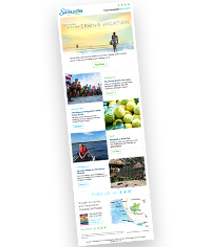 Visit Sarasota County Monthly E-Newsletter | Sign Up Today! Have our monthly e-newsletter delivered to your inbox and stay in the know on upcoming events and the latest news in Sarasota County. The best part? You can read it on your computer, tablet or smartphone. Want a sneak peek? Take a look at this sample issue. Yes, please send me travel and tourism emails from Visit Sarasota County. I’m interested in receiving a FREE Sarasota County Visitor Guide.